An old (2005) post about Napster was recently brought to my attention. In it, Don Dodge, a former VP of product development at Napster maps out what happened to the company, how they pleaded with the music industry to provide a better solution to them (which was more or less reinvented/reimplemented many years later by iTunes) and how the music industry had put itself in such a position as to be literally unable to act in its own best interests, or the interests of its artists. Dodge estimates, based on internal Napster research, that Napster could have generated $3 billion per year for the industry, with minimal overhead. 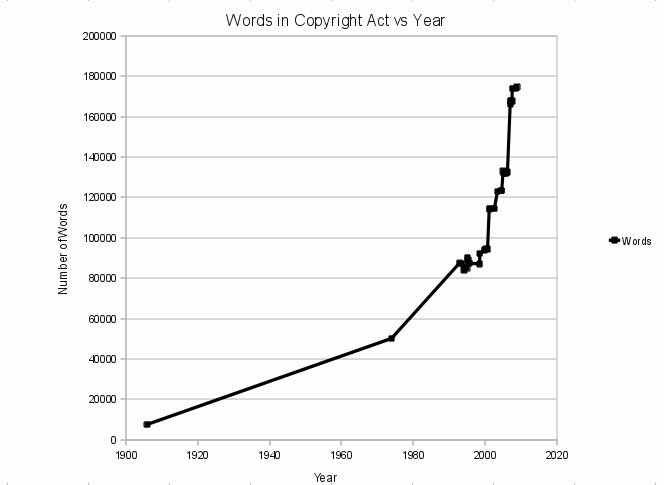 I talk to people at copyright conferences and they will make some observation such as copyright has managed to support specific identified individuals and therefore it’s a good thing (most recently it was specific teachers whose retirement was funded by their textbook sales). However, to rely on this sort of evidence in policy making is basic bad practice. It seeks out only the evidence which supports the proposition, when it should be critically analysing it. A proper analysis would look at how many people paid more than they ought to have for a book, and whether some people went without because the cost was too high. Moreover, it would look at the also-rans who devoted much time to writing a textbook only to have it fail in the market. It would look at the books which were substandard and were not improved because of copyright restrictions. For every success there are orders of magnitude more failures. Proper policy would be more circumspect in trying to entice, through the incentive of copyright, the unwary into the market. Copyright costs the community. That cost is never factored into any copyright policy – at least, so far as I have been able to tell. Most recently, the prohibition on parallel importing of books is an obvious example. The Productivity Commission put out a report which set out, in bare, incontrovertible terms, the damage that this particular aspect of copyright does to the community. After a long period of merciless lobbying the proposals to remove the anti-consumer restrictions on parallel importing have been defeated (ironically, the report was criticised for being considered analysis, it was even expanded to cover some of the criticisms of it). Copyright, and IP policy in general seems to exist in a twilight zone in which reality is not permitted to reach. Copyright holders have express exemptions to the Trade Practices Act that property owners can only dream of. They are funded by the government to lobby for more copyright and then, of course, use their monopoly profits to lobby for more funding. They are allowed to sing the benefits while policy makers fail to even seek out evidence of the costs. 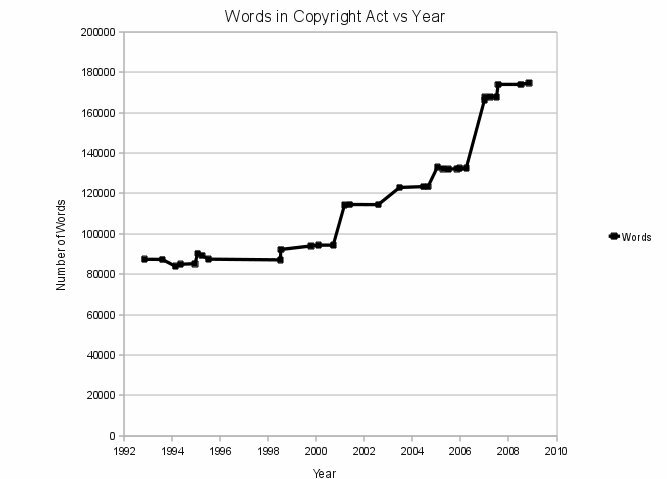 Despite the concept of natural rights of copyright being expressly repudiated by parliament and judiciary they are allowed to persist in their rhetoric of rights. 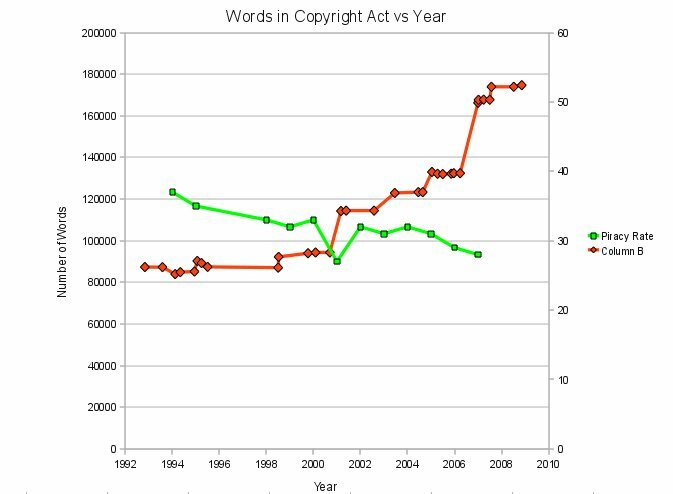 Despite the copyright monopoly having little in common with property, they continue to talk as if it does. In the case of Napster, the copyright monopoly seems to have delayed the innovation we now call iTunes by a good part of a decade, and diddled musicians out of billions of dollars in the process, but copyright ideologues will not hear of it. Professor Fels said the decision to explicitly reject a recommendation of the Productivity Commission meant that ”every time one of our more than 10 million book readers visit a bookshop and pay more for books, the Government will be and should be held responsible”. Russel Coker has published an article referencing some copyright related posts. In passing he noted that the Copyright Agency Limited apparently doesn’t pay you distributions if your entitlement is below a certain threshhold. 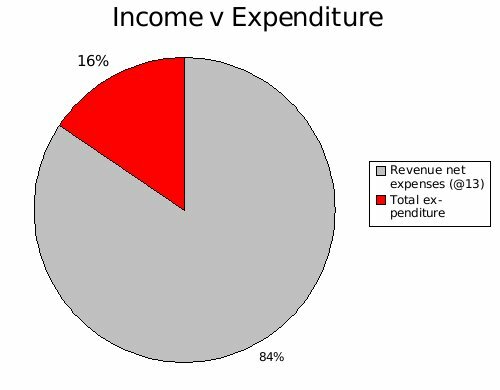 His article prompted me to finish a blog post I had been meaning to do for some time – an analysis of one of CAL’s annual reports. Every year CAL produces an annual report on their activities through the year (unfortunately CAL appears to have removed their 06-07 report from their website, so you’ll need to get a hard copy if you want to cross check these figures). I thought it might be an idea to have a look at one of these reports to extract some information from it. 1. 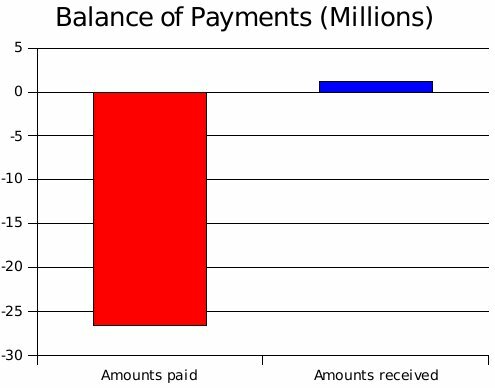 Almost 20% of the amount distributed was sent to foreign collecting societies. 2. 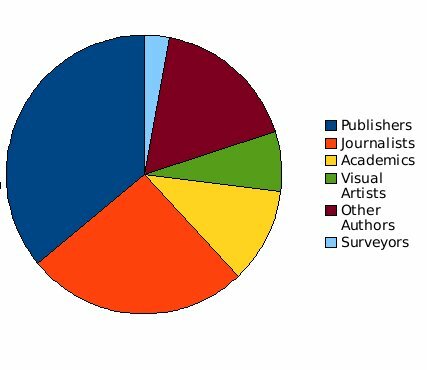 Despite comprising only 36% of members (see below), publishers have received about 71% of the total distribution. 3. 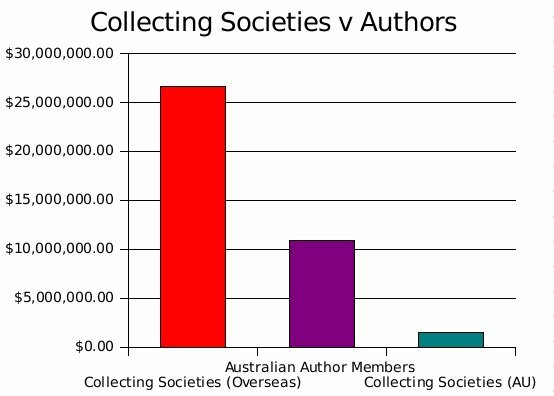 Given that Australian collecting societies comprise only 1.12% of the distribution it is probably not appropriate to give them too much weight. CAL in its report makes reference to the fact that, including indirect members, CAL represents 28,000 rights holders. Presumably the excess over the roughly 10,000 direct members are accounted for in this 1.12% figure. 4. 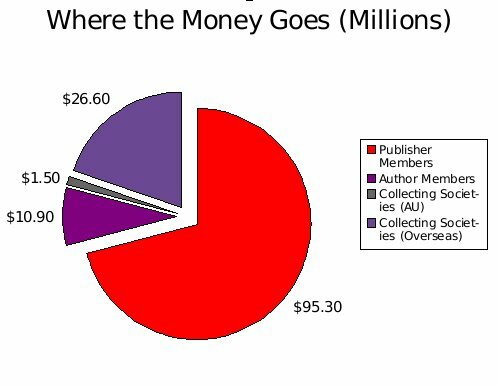 A minority of the distributions were paid to authors (whether Australian or foreign – even assuming all of the money sent overseas went directly to authors and not 70% to publishers as in Australia). As per above, $26.6 million was sent to overseas collecting societies. In return, CAL received $1.2 million from overseas collecting societies destined for Australian authors. CAL paid $26.6 million to overseas collecting societies and received $1.2 million in return (@46). * Note: the report does not expressly disclose the number of author members, but it is no more than the total number of members less the number of publishers. 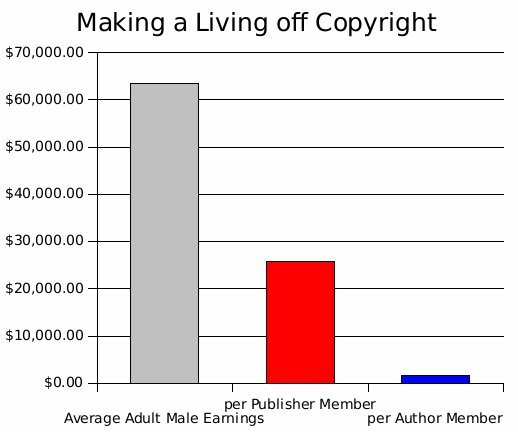 Average distribution to authors = $1,658, or about 3% of average adult male earnings. 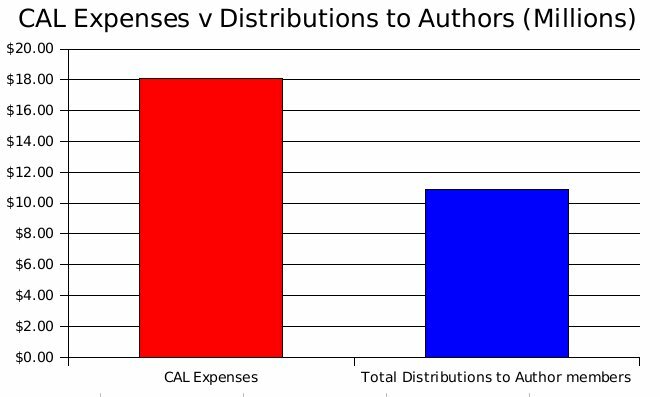 Based on these numbers, for an author member to receive average adult male earnings from CAL distributions roughly 33 other CAL author members would need to receive nothing. It is not clear how other collecting societies are categorised here. Today marks the (soft) launch of a new journal dedicated to Free and Open Source Software legal issues (a “hard” launch with printed copies is happening in London on Wednesday). The International Free and Open Source Software Law Review is an initiative of the freedom taskforce run by FSF Europe. I am on the editorial panel and am also happy to take credit for initially floating the idea of having a journal. I am also happy to praise the enormous effort that has gone into putting the law review together by the other members of the editorial committee and to the sponsors for supporting it.